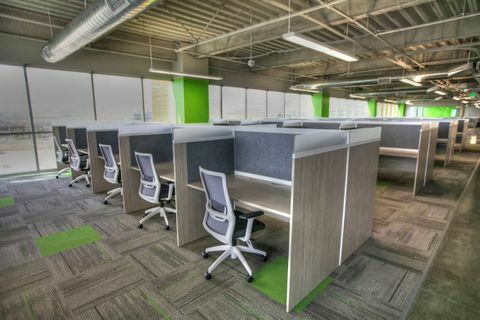 This Stylish Call Center Workstation Design is a refreshing departure from the “cube' world and incorporates beautiful woodgrain laminate panels, high-tech acoustic felt interiors for maximum sound absorption as well as frosted acrylic side up-mounts to let natural light in and for visual interest. This application isn't just for Call Centers though…it's for any workstation application where a bit more privacy and acoustics are needed while still letting light in and not feeling so enclosed. It's a great Value as well. The Station size as shown is 30'D x 60'W x 54'H. Other common sizes for this design would be 30'D x 48'W (on the smaller side) and 30'D x 72'W if more desktop space is needed. Panel heights are customizable. There are numerous laminate panel applications in modern woodgrains as well as white. The interior acoustic felt comes in 15 different colors to work with your building interior and brand.